Do you like infographics? Check out How Information Graphics Reveal Your Brain's Blind Spots, ProPublica (April 20, 2016). Kicking off a new series on Visual Evidence, Lena Groeger highlights dozens of creative graphics that can teach about all sorts of topics, from playing the stock market to segregation in housing. 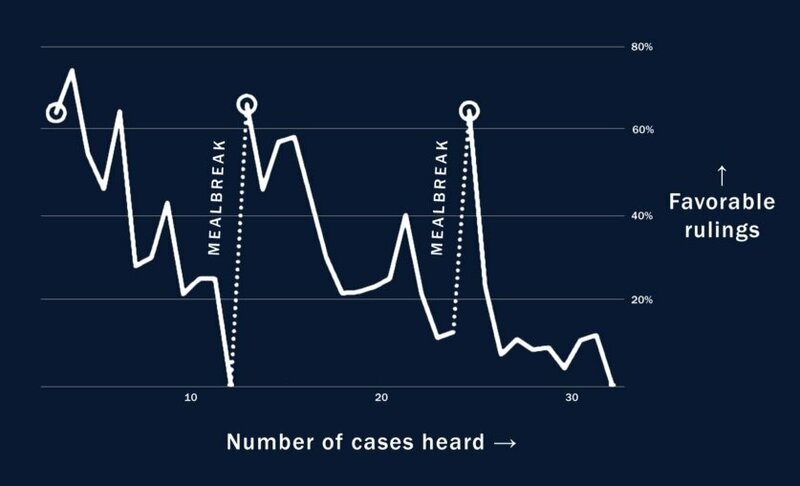 For example, here's a graphic charting the severity of judges' rulings against when the judges had a meal break. Hopefully students don't choose to go to Law School with the intention of being fiction writers. But it is impossible to deny that many famous authors got their start as lawyers. Law graduates like James Patterson and John Grisham have become famous for writing novels with legal themes. Lawyer authors are not just found in the mystery or crime genres either. New York Times bestselling Young Adult author Carrie Ryan is a University of North Carolina School of Law grad. With many lawyers becoming authors it should come as no surprise that Law Schools are offering fiction classes to their students. The University of Iowa, famous for their writer's workshop, offers a course entitled Narrative Strategies for Lawyers. Professor Michelle Falkoff, who taught the course for the first time in 2012, said that, "Fiction writing offers good lessons to lawyers about good writing and editing." Falkoff is the author of the young adult novel Playlist for the Dead. The University of Baltimore School of Law offers a class called Fiction Writing for Law Students. The class is designed for students who wish to develop story-telling and teaches the basics of fiction writing. The University of Arkansas also offers a seminar about the Law and Literature. Yale professor Stephen Carter said that one of the reasons many lawyers write fiction may be because of the Socratic Method. It teaches lawyers to think about the "what if's". This thought process can naturally spiral in to a full-fledged novel idea. The lawyer-turned novelist is so prevalent that the Journal of Legal Education published, for the first time in 2013, a special fiction edition. The American Bar Association - Young Lawyers Division also wrote an article about the possible ethical pitfalls that could befall a budding lawyer-novelist. If you are a short story writer the ABA Journal is hosting the Ross Essay Contest. The contest is currently accepting entries. The entries must be no more than 5,000 words and illuminate the role of law/lawyers in modern society. Submissions close May 31, 2016 and the winner will receive a $3,000 cash prize. Whether it is the Socratic Method turning lawyers and law grads in to authors, or that law school teaches writing skills and diligence. One thing is for sure; many lawyers have found success in the publishing world. Casetext recently announced several new features designed to make finding cases more efficient. Casetext is a free resource that anyone can use. Law students who will be working this summer in positions where they will have limited access to Westlaw or Lexis Advance may find this website especially useful. On Casetext, users can read the full text of cases, including cases from the U.S. Supreme Court, federal circuit courts, federal district courts, state supreme courts, and state appellate courts. These cases are annotated by attorneys and other members of the legal community. Casetext is a particularly helpful tool to use during the early stages of research when searching for relevant cases. You may be interested in this article from law.com: "Supreme Court's Style Manual is Private No More"
“I don’t have a confidential source,” Metzler said. Instead, he went to the court’s library, which is open to members of the Supreme Court bar like him as well as court staff and certain congressional and executive branch employees. He was given a copy—unnumbered—of the 2013 version of the manual, which he then photocopied. This brings up a difficult collection development question for law libraries. I vote against. This morning KUOW compared the tax systems in Washington (no income tax) and Oregon (no sales tax, no business & occupation tax). And today's installment of The Economics Daily from the Bureau of Labor Statistics shows that Washington State and Oregon have, respectively, very low and very high concentrations of tax preparers. The University of Washington's Office of the University Architect announced last night that the School of Law will return to its former home in Condon Hall this summer, while Startup Hall and other functions currently housed in Condon Hall will move to William H. Gates Hall. William H. Gates Hall (top) and Condon Hall. If you look carefully, you can tell that the photo of Condon Hall is in color. When asked to comment this morning, university officials acknowledged that there might be some disruption involved but assured students, faculty, and staff that the building swap would be for the best. 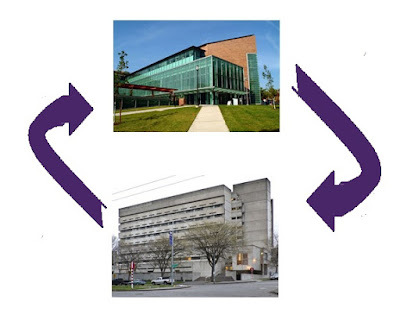 "Being near the Foster School of Business will be very helpful for startups, while returning Law to the West campus will, um, move it back to the West campus," stated UW President Annie Mary Kossy.